No, I didn’t say any of that. In fact we didn’t speak at all; we looked at each other like people who have lived and loved together for a long time and took off in opposite directions down the beach. As I was walking and half-running, I did not stop to look at shells. I don’t perfectly remember the occasion, since it was more than 27 years ago, but I am quite certain that had I even seen a perfect shark’s tooth lying in full view, I would not have taken the second away from my search to pick it up. I also did not look out at the porpoises playing in the water or the college kids playing Frisbee or volleyball on the beach. As much as I love to just walk lazily down the beach and feel the sand in my toes, I did not think about that at all. I had one thing on my mind. I was consumed by it. My daughter was gone and I had to find her. 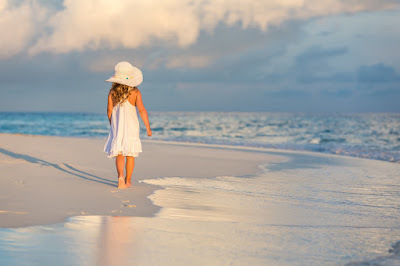 When our daughter wandered off down the beach, she never found what she was looking for. She didn’t even know what it was. Hannah also had no idea about the dangers all around her as she wandered aimlessly. She was found and brought back home by parents who loved her and went looking for her. If you are seeking truth with all your heart, you will find it. Rather, he will find you. Jesus Christ said, I have “come to seek and to save that which was lost.” When it comes right down to it, he is the seeker. We are the lost.